While I don’t usually feel sorry for characters who suddenly lose their family fortune, and in this case I did get frustrated with Lorrie a few times. She was complaining to the boy who had the exact same thing happen to him just a few years prior. She kept telling herself that at least she was still better than him. Come on, though, I think Sheinmel wanted us to kind of hate her in those moments. This is also an American story, like I said. I kept drawing parallels between the Kennedy’s and Lorrie’s boyfriend’s family. Because Lorrie is dating Charlie Copeland, the son of an esteemed US senator, and he lives in the house. Because in Idlewald, Road Island, there are houses builders that try to emulate the Copeland estate, and there are families who want to stay as far away as they can from Lorrie’s own crumbling mansion. I honestly want to hear what you think about this one. 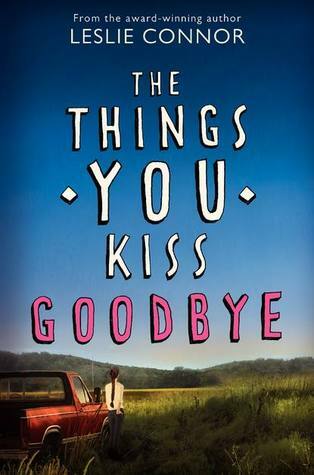 A lot of Goodreads reviews talked about how much they adored this book (and as a YA debut, I really like it, too). However the ending of this book seemed too… neat. There’s a scandal in the last 1/4 of this piece that makes me yearn for an ending that is just as messy. So when there’s so much hope and love and acceptance at the end, it just kind of made me think Sheinmel was afraid to pull an R.R. Martin. I’ve known about this book for a while. Well, since the beginning of 2015 when it was published. So I’m ashamed to say that I didn’t read it when it came out, but in my defense I was going through my “only YA and picture books” phase, and I didn’t get out of that until about four months ago. So here we are today. I’m reformed. In my reformed state I’m here to tell you that Stella by Starlight was one of those books that I’ll probably never forget. From Stella’s tenacity that I truly believe I see every day in my patrons and remember feeling myself, to her confusion about why things are happening the way they are, I’ll never forget it. Nevermind the fact that a certain political candidate has Klan members at his rallies nowadays, this book was extremely relevant to the social climate today even though it took place during a time when Jim Crow laws were being enforced. What starts out as a fire witnessed by Stella (11-year-old wannabe reporter from Bumblebee, NC) and her brother Jojo quickly becomes an issue throughout the town. That wasn’t just any fire. It was the Klu Klux Klan, and they’ve made their presence more than known to the people of color in Bumblebee. When Stella’s father, the local minister, and another local father go to register to vote, a family is targeted. Suddenly the idea that she might not be the best writer in her class is overshadowed by the reality that there’s a family of 12 that suddenly finds itself without a home. While Stella grapples with the implications of racism in her town, she also sees kindness from her African American neighbors and even some of the white people in town. This was difficult to read, simply because it is so relevant today. Your heart breaks for Stella, her family, and the fact that many children had similar or worse experiences than she did at this time. Have you read Stella by Starlight? If so, let me know what you thought of the book. If you haven’t, does this sound like something you’ve read recently? This book was great to me, not only because it resembles Isabelle Arsenault’s illustration style (and I’ve gone on about that before) but because it’s got absolutely phenomenal cultural representation. It’s a great introduction to time zones–the whole thing is all about what various children around the globe are doing in one moment–but it also features many countries that are underrepresented in picture books. For example, “in Nuuk, Greenland, it is three o’clock in the morning, and Lexi can’t sleep,” along with Hanoi, Vietnam, and Baghdad, Iraq. Obviously all children are fictional, but the introduction to various countries is crucial, especially those that are often featured on the news in a way that might be scary for young readers. It’s important that they see there are people like them all over the world, and we all do similar things! Can you guess who this one is about? You’re right! 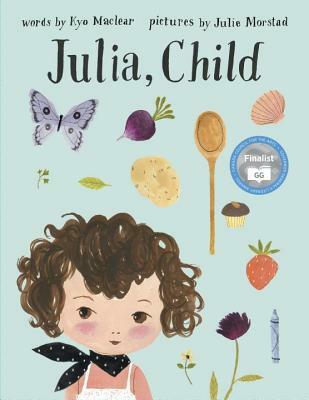 In this book, Julia and Simca’s friendship is front and center, and readers explore a world of culinary delights that unite children and adults alike. Charming illustrations accompany and feature scenes like a lovely French street market, cooking class with snobby would-be cooks, and of course two friends who want to share their passion for food with others. It’s no wonder that I love this book–it features two of my very favorite things in the world! Side note: Here’s another one by Kyo Maclear. I think I have a new favorite picture book author for 2015! What great picture books are you guys excited about this week? Woah. This book packs a huge punch. I was expecting something akin to Winger when I started this one, mostly because of the frequent comic strips peppered throughout the novel. You see, Drew is an artist. His character, Patient F, has also lost everything in the hospital. 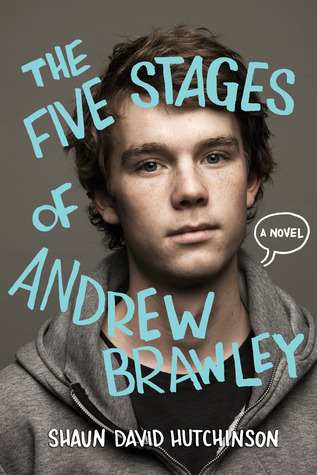 Like Patient F, Drew is struggling to survive in a world where his family no longer exists. Anyways. 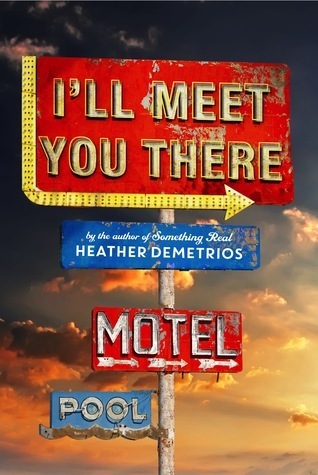 In his tragic life, Drew is the hero and Death personified is the villainous social worker (known to everyone else as sweet Miss Michelle) who wants to take him away from everything stable and good in his life. He works for cash in the hospital cafeteria, he volunteers and is friends with his makeshift family of nurses, his friends are two straight cancer patients in the peds ward, and he sleeps in the unfinished wing of the hospital. But when a boy comes in to the hospital with third degree burns on his legs, arms, and chest, Drew has to know more about him. He’s drawn to Rusty. His agonizing screams pull Drew in. So he adds a new routine to his life: every night Drew sneaks into the ICU to read to Rusty and tell him about himself. Drew soon learns about Rusty’s tortured life as a gay teen, and Drew confides that he hasn’t had the same experience. Drew also vows to protect Rusty from Death. His new routine is threatening to throw his entire life off-balance. When Death starts to notice Drew, he’s got to decide whether to protect his friends, protect Rusty, or protect himself. If you’re in for a good cry, then I’d definitely say that this is the book for you. However, if your TW is child death or anything like that, I’d stay away from this read, as Drew reflects often on his six-year-old sister, Cady’s death (and there is a graphic scene where Drew tries to give CPR to a dead three-year-old). This book ain’t for the faint of heart. The author, Shaun David Hutchinson, has a pretty sweet Twitter page. I’d check it out, if only to see what an awesome nerd he truly is.